HIDA's Accredited in Medical Sales (AMS) program is a comprehensive sales education system designed to improve healthcare distributor and manufacturer sales performance. Healthcare companies use the AMS program to educate their sales teams on healthcare customer challenges, selling skills, product knowledge, and more. Timely: courses and webinars regularly update reps on current issues facing healthcare customers. 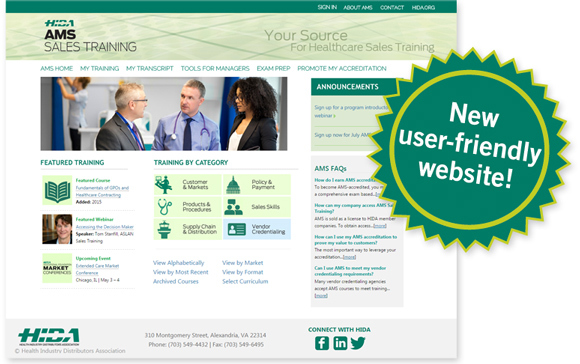 Comprehensive: Up to 100 course offerings address topics in acute care, non-acute markets, selling skills, reimbursement, and more. Flexible: curriculum is fully customizable.